Megan Duffy – Photo courtesy of Scott Kissell/Jeff Sabo and Miami Athletics. One week after Carolyn Kieger left to take the head women’s coaching job at Penn State, Marquette announced the hiring of Megan Duffy as the sixth women’s coach in program history. 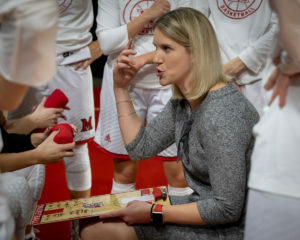 The 34-year-old Duffy spent the last two seasons at Miami (Ohio) where she led the RedHawks to back-to-back Women’s National Invitation Tournament appearances. The RedHawks lost in the first round both years, finishing last season with a 23-9 record, including a 13-5 mark in the Mid-American Conference. Duffy went 44-20 in her two seasons at Miami. Duffy played collegiately as a guard at Notre Dame from 2002-’06, helping the Irish to four consecutive NCAA Tournament appearances. She is one of four players in school history to collect 1,000 points, 500 assists and 200 steals. Marquette athletic director Bill School was an administrator at Notre Dame when Duffy was a player. Kieger went 99-64 in five seasons with the Golden Eagles and was named the 2018 Big East co-coach of the year. She led Marquette to a pair of regular-season league titles and a conference tournament crown over the last three seasons.